At St. Stephen’s we work hard to create a warm yet challenging environment for our Key Stage 1 students (aged between 5 and 7) and to ensure a smooth transition from Early Years into the Primary section. We are committed to individual achievement and highly value the uniqueness of individuals. Our class sizes are small and each has an experienced, internationally qualified teacher and a teaching assistant to ensure a low child to adult ratio. 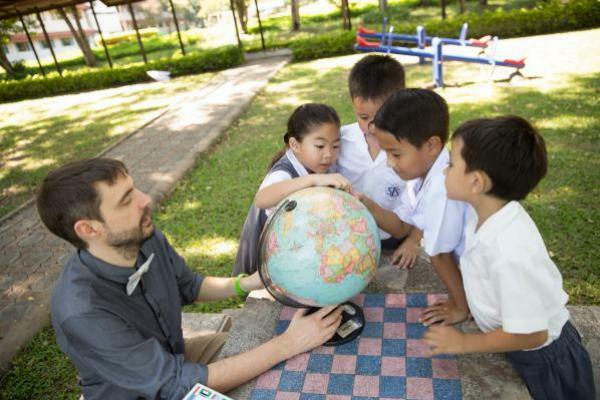 Classroom teachers follow the English National Curriculum for literacy and numeracy which we adapt to meet the needs of international school students in Thailand. Alongside this we use the International Primary Curriculum (IPC). Our students also go to specialist teachers for Thai and Western Music, Thai and Mandarin languages and PE. Year 1 and 2 classes enjoy a number of field trips every year to enhance students’ learning in different contexts. As well as a fully equipped library and ICT lab, tablet computers are used to support learning inside and outside the classroom. We have a strong after school extra-curricular programme which helps to develop students' social skills, improve academic performance, and build strong supportive relationships with other children and adults. St. Stephen’s is dedicated to ensuring students receive the very best education whilst celebrating traditional Thai values, focusing on our School’s vision of East meets West.